There are plenty of things to keep your family busy while you visit Alpena: Sanctuary of the Great Lakes. From exploring the great outdoors, to experiencing interactive indoor activities, you won’t have time to be bored. Here’s our list of the top 49 family fun adventures (in no particular order) for kids of ALL ages! Explore a one-of-a kind play fort with totem poles at Shin-ga-ba Shores playground in Ossineke. Get up close and personal for a photo op with giant Paul Bunyan and Babe the Blue Ox in Ossineke. Put on your water sandals and shorts and head down to Duck Park on Thunder Bay River to rent kayaks for a blissful water trip through the 500-acre Alpena Wildlife Sanctuary. Get engaged in an entertaining story hour at the Alpena Co. George N. Fletcher Public Library. Stop at Downtown Scoops for a scoop of your favorite flavor of ice cream in delicious handmade waffle cone, or get a root beer float with Alpena’s Stony Acres Shipwreck Soda. Learn how to use an outdoor sluice and pan for gemstones at Cedar Panning. Take home whatever you uncover, from real gemstones to arrowheads! 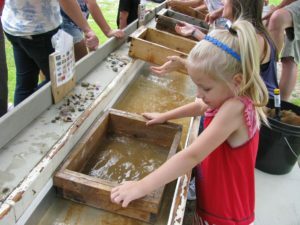 Search for gems and other treasures at Cedar Panning, photo courtesy Brielle Helwig. Take a spin on a carnival ride, then pet a pig and watch turkeys strut in the animal barns at the Alpena County Fair in August. Climb the tallest accessible lighthouse in Michigan, the New Presque Isle Lighthouse, and get a spectacular panoramic view of both Grand Lake and Lake Huron sparkling under blue skies. Walk the breakwall at the Alpena boat harbor and watch the ships come in. Stop and play on the playground toys at the Kiwanis Kiddie Park on your way out. Take a leisurely stroll along the hand-hewn timbers of the covered bridge connecting Duck Park to Island Park, and escape into the serene wildlife of this 17-acre nature preserve. Test out your sea legs on a life-sized recreation of the historic 19th Century Great Lakes wooden schooner at the Thunder Bay National Marine Sanctuary’s Great Lakes Maritime Heritage Center. Glide over the smooth inland waterways or adventure out on the big lake on a Stand Up Paddleboard (SUP). Rent a small motorboat from Fletcher’s Landing or Jacks Landing and cast a line into the Fletcher Floodwaters; where the casting and reeling is fun and the fish are plenty. Test your skills on the challenging and entertaining vintage course at Lee’s Miniature Golf: Michigan’s longest running mini-golf course. Can you master the Chip Shot? 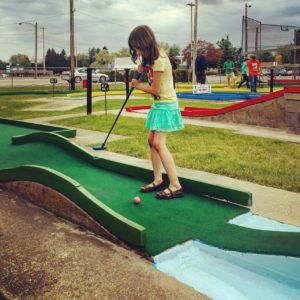 Lee’s Miniature Golf is Michigan’s longest continuously run mini golf course. It sits along the Lake Huron shoreline. Breakfast is a favorite at Nick’s Southside Diner, an authentic 1950’s box car diner, where you can request your pancakes in fun shapes like bunnies or tractors. With a name like Knaebe’s Mmmunchy Krunchy Apple Farm, you are sure to have some good Fall family fun! Who’s up for a pony ride, or a try at the Mac’n’Squasher apple slingshot? Rainy day blues? Head over to the Thunder Bowl Lanes for some family fun with glow bowling. Get your Laser Team Challenge on! The 90-year-old National Guard Armory building sets the stage for fun with 3 floors and 45,000 square feet of challenge space. Pack lunch and enjoy a picnic at one of the many parks throughout the region. Put on your water shoes and wade in the water at Ocqueoc Falls. Ocqueoc is the Lower Peninsula’s largest waterfall, and is also the only universally accessible waterfall in the United States. An ideal destination for everyone! Stop into Bob’s Bullpen Comic Shop in downtown Alpena and get your comic book or graphic novel fix. While there, check out the professional work artist Bobby LeFevre has done for TMNT and Transformers! Stroll the cobblestone streets on the historic avenue of replica shops at the Besser Museum of Northeast Michigan and pretend you are living in Alpena in the 1890’s. Catch a live performance at Alpena’s professional Thunder Bay Theatre or Alpena Civic Theater, and enjoy a musical, comedy, or children’s theater production. Drop by the Art in the Loft Gallery, Thunder Bay Arts Gallery or 45 North Art Gallery, all in Downtown Alpena, to admire works by local artists. Check out their workshop and events schedule for a variety of fun activities for all ages. Grab a bucket and sand tools and build a sandcastle in the sugary smooth sand at Starlite beach. 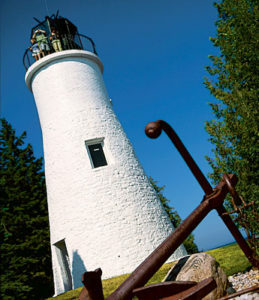 Climb the hand hewn stone steps of the 30 ft. tall Old Presque Isle Lighthouse and take in the view from the top. Keep an eye out for the ghost that is said to keep the light burning. Hear the ghost story at the Old Presque Isle Lighthouse. Visit Campers Cove RV Park & Canoe Livery. Rent paddle boats for simple water fun on Lake Winyah, or take a relaxing trip down the Thunder Bay River in one of their canoes or kayaks. Wander through a forest with over 26 life-size dinosaurs at Dinosaur Gardens Prehistoric Zoo in Ossineke. Don’t leave without climbing into the belly of the brontosaurus. Race on the longest go kart track in Michigan at Arzo Sports & Fun Park, or launch into outer space on the Spaceship Simulator. Dive the shipwrecks of Thunder Bay without getting wet from aboard Lady Michigan, Alpena’s glass bottom boat. Skate! Roller skate, ice skate, glow skate – it’s all about gliding at Northern Lights Arena! Check out their events calendar for skate schedules or catch a Shipwreck Alley Roller derby bout. Hike along the Sunrise Coast Birding Trail hotspots and see if you can identify a Bufflehead or a Grasshopper Sparrow. Get crafty at Cobbygoose: the place to paint and more! There are so many fun possibilities; you’ll just have to check it out for yourself. Or, make your own perfume or nail polish at Soaps & Such in Downtown Alpena. Grab a blanket and enjoy an outdoor cinema under the stars with the family at Summer Movies by the Bay! Lace up your adventure shoes and discover the hidden world of Geocaching in the Alpena area. Take a trip to Bell Bay beach and skip rocks across the Lake Huron waters. Roast marshmallows over a fire by one of the many lakes while you listen to the soothing waves and watch the stars come out. Sit on a nearby park bench and watch the Second Avenue Bridge ( once voted the most beautiful bridge in America) open up over the Thunder Bay River to let boats pass through. Visit Stoney Acres Winery and pick out delectable handmade chocolates and delicious caramel corn for the kiddos while you sample local wine. Take a tour of the city on the Trolley. Hitch a ride between 15 different stops around town that will take you to shops, beaches and parks, and get there in style! Rent bicycles for the whole family from Friends of the Thunder Bay National Marine Sanctuary or Performance Locker’s Alpena Pedal & Paddle Outpost at Duck Park. Explore the city along Alpena’s 18.5 mile Bi-Path and Great Lakes Maritime Heritage Trail. 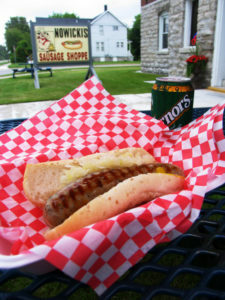 Try a Nowicki’s brat and take it to go for a picnic at one of Alpena’s beautiful city parks. Climb into the reading tree nook at Blue Phoenix Bookstore and flip through your favorite Dr. Seuss. Hunt for fossils from the Devonian Period at Rockport State Recreation Area. Bring a bucket- you can take up to 25 lbs. home! Grab some popcorn and kick back for a flick on the silver screen at Alpena’s State movie theater. Pick out your favorite flavors of handmade brats at Nowicki’s Sausage Shoppe and grill out at one of Alpena’s city parks. Take the kids to the Alpena Farmers Market and let them choose their own favorite fruits and vegetables. Check their events schedule for fun kid activities! Swing by Blair Street Pier and take a stroll out on the wooden boardwalk for a breathtaking view of Lake Huron’s Thunder Bay. Even better, do it early and see what this ‘Sunrise Side’ buzz is all about! Hike to the limestone pile at Rockport State Recreation Area for remarkable views of Lake Huron. Wait until after dark for an incredible stargazing adventure at this newly designated Michigan Dark Sky Preserve.